I have compared Vincent's notes and GIFs to two books on Indian flags: K V Singh: Our national flag (New Delhi, 1991) and P T Nair: Indian national symbols (Calcutta, 1987). 'History Today' has taken some liberties, it seems, especially in terms of colours (using blue instead of green). The fault is unlikely to lie with 'History Today': the green of the 1931 Congress flag and of the 1947 national flag are both reproduced correctly in the illustration so I think the error in the colouring must have been made by the original artist who was working in 1947 - strong evidence that the details of the earlier flags were not well known in India at that time. When I visited the Gandhi Memorial Museum in Bombay in January 1999, I found a framed picture of 6 old Indian flags entitled "Our Flag". These are slightly different to the illustration in a booklet called "Our Flag", published by the Publications Division, Ministry of Information and Broadcasting, revised edition 1989. The flags use saffron rather than red. The museum may be stressing the influence/contribution of the Indian National Congress to independence. From the cover of the August 1997 issue of 'History Today'. This flag is fully visible. It is a horizontal tricolour of dark blue. yellow and red. The upper (blue) stripe bears eight stars with varying numbers of points (this may reflect the carelessness of the artist but see under '1907' below). From the hoist to the fly the stars have 6, 7, 7, 7, 6, 7, 7 and 9 points. The yellow stripe has an inscription (वन्दे मातरम् black or dark blue) in Devanagari script. The red stripe has a white sun in the hoist and a white star and crescent in the fly. This would probably be the 'Calcutta flag' (Singh), or 'Lotus flag' (Nair). According to both Nair and Singh the colours are green over yellow over red and the stars are actually half open lotuses (eight in all). The inscription is blue and reads in transliteration 'Vande Mataram' (Nair: 'Bande Mataram'). As Vincent notes, the red stripe has a white sun in the hoist and a white star and crescent in the fly. The lotuses are also white. The flag was first used at an anti-partition rally in Calcutta 7 August 1906. According to Nair, the designers are unknown, but Singh credits Sachindra Prasad Bose and Sukumar Mitra. Apparently, the exact design is unknown, because Singh notes that the illustration in his book is a reconstruction based on a description. The first national flag in India is said to have been hoisted on August 7, 1906, in the Parsee Bagan Square (Green Park) in Calcutta. The flag was composed of horizontal strips of red, yellow and green. The red strip at the top had eight white lotuses embossed on it in a row. On the yellow strip the words Vande Mataram were inscribed in deep blue in Devanagari characters. The green strip had a white sun on the left and a white crescent and star on the right. "The second flag was hoisted in Paris by Madame Cama and her band of exiled revolutionaries in 1907 (according to some in 1905). This was very similar to the first flag except that the top strip had only one lotus but seven stars denoting the Saptarishi. This flag was also exhibited at a socialist conference in Berlin. This is perhaps not the same flag as in the the one described as the First National Flag, 1906, in the booklet "Our Flag". In the booklet, the upper band is green and the centre of each white lotus flower is a dot of the same size as the surrounding petals. The lower band is red. The brown panel in the 1906 version seems to be a printing error for yellow. From Our National Flag by K.V.Singh. Our National Flag by K.V.Singh notes "... had three broad bands. The top one was green, sacred to the Muslims, the middle was a golden saffron, the sacred colour of both the Buddhists and the Sikhs, and the bottom band was red, sacred to the Hindus. There were eight lotuses in a line representing the eight Provinces of British-India. On the middle golden band, Vande Mataram was inscribed in Devnagari script. However it was wrongly spelt. From the photograph it appears that the lotuses were embroidered. May be, Madame Cama herself did the embroidery. On the bottom red stripe, there was the sun towards the fly and a crescent towards the hoist of the flag." From the cover of the August 1997 issue of 'History Today'. Half of the flag in the lower fly is obscured, but it seems to be the same as 1906 above except that the stars on the upper stripe all have six points and that the one closest to the hoist is considerably larger than the others. This could be the flag of Madam B R Cama, called the Saptarshi flag by Nair. This flag was hoisted in Stuttgart at the International Socialist Congress 22 August 1907. The colours, according to Singh, were green over saffron over red. Again, eight white lotuses are set on the green stripe. Singh points out that the inscription 'Vande Mataram' is wrongly spelt in Devanagari script. He also notes that some illustrations show a crescent and a star, but that this is wrong. Nair claims the colour order was red, saffron, green, that the top stripe had a lotus and seven stars, and that the bottom stripe had a sun and moon with star. The booklet "Our Flag" mentions that this flag, hoisted at the International Socialist Conference in 1907, is displayed in the library of Mahratha and Kesai in Pune. In the booklet, the upper band is green with the eight white lotus flowers in profile. The word "वन्दे मातरम्" (Vandemataram) in the middle yellow stripe is inscribed in white and spelt differently. The penultimate symbol is omitted and the final symbol is different. The lower band is red. The sun is in the fly corner, the crescent moon, with no star, is in the hoist corner. From the cover of the August 1997 issue of 'History Today'. Half of the flag in the lower fly is obscured. There are nine horizontal red and blue stripes with a small union jack (three stripes high) in the canton. Two white stars are visible in the lower hoist and there are probably more stars in the part of the flag which is not visible. A significant difference between the image shown here and the 'History Today' illustration is that the star and crescent in the upper fly is missing from the latter. Is this, perhaps, a reflection of the communal tensions which existed in 1947? On the other hand, a star and crescent are shown in the 1906 flag, so it may be just another indication of the artist's lack of familiarity with the older flags. 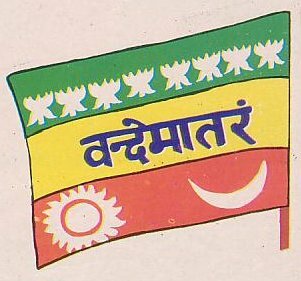 This one is probably the flag of Dr. Annie Besant's and Lokamanya Tilak, associated with the Home Rule Movement of 1917 and hoisted during the Congress session in Calcutta. The stripes are red and green according to both Nair and Singh (five red, four green), while the Union Jack is in red and blue only. A crescent and a star, both in white, are set in top fly. The white stars number seven in all and are arranged as in the Saptarishi configuration. By the time our third flag went up in 1917, our political struggle had taken a definite turn. Dr. Annie Besant and Lokmanya Tilak hoisted it during the Home [R]ule movement. This flag had five red and four green horizontal strips arranged alternately, with seven stars in the [S]aptarishi configuration super-imposed on them. In the left-hand top corner (the pole end) was the Union Jack. There was also a white crescent and star in one corner. This indicated the aspirations of the time. The inclusion of the Union Jack symbolised the goal of Dominion Status. The presence of the Union Jack, however, made the flag generally unacceptable. The political compromise that it implied was not popular. The call for new leadership brought Mohandas Karamchand Gandhi to the fore in 1921 and, through him, the first tricolour. During the session of the All India Congress Committee which met at Bezwada (now Vijayawath) about this time, an Andhra youth prepared a flag and took it to Gandhiji. It was made up of two colours—red and green—representing the two major communities. Gandhiji suggested the addition of a white strip to represent the remaining communities of India and the charkha to symbolise progress. Thus was the tricolour born, but it had not yet been officially accepted by the All India Congress Committee. Gandhiji's approval, however, made it sufficiently popular to be hoisted on all Congress occasions. According to Mudassir Rizwan (India News, 3 February 2008), the "Andhra youth" is Pingali Venkaiah, born in the village of Batlapenumarru, district of Krishna, Andhra Pradesh, on 2 August 1876, and deceased on 4 July 1963 in penuary. Venkaiaha presented the flag to Mahatma Gandhi at All India Congress Committee session in Vijayawada held in 1921. From the cover of the August 1997 issue of 'History Today'. One quarter of the flag in the lower fly is obscured but I think that it is unlikely to contain any additional features. The flag is a horizontal tricolour of white, dark blue and red with a large black spinning wheel in the centre. According to Nair and Singh this was the flag approved by Gandhi in 1921. However, the colours are white, green and red, with the charka in dark blue set all over close to the hoist. This flag was not formally adopted by the Indian National Congress, but nevertheless widely used. The Flag used during India�s early phase of freedom struggle white over green over red (not saffron) emblazoned with a Charkha (spinning wheel) in the centre was designed by Pingali Venkayyaa. The flag was known variously as Swaraj Flag, Congress Flag, Gandhi Flag, etc. Mahatma Gandhi called it National Flag. Gandhi in an article titled �The National Flag� in Young India in April 1921, had focussed his ideas about what should constitute our flag. Pingali Venkayyaa was then asked to modify his (Pingali�s) earlier design - a plain �green over red� flag to incorporate Gandhi�s idea on the flag. The Swaraj flag was never adopted by the Indian National Congress (INC) as the National flag by a formal resolution. From the cover of the August 1997 issue of 'History Today'. Again, a quarter of the flag in the lower fly is obscured but I think it is probably blank. The flag is orange with a black or dark blue spinning wheel in the canton. Singh says a flag of saffron with a reddish brown charka in the canton was recommended by the flag committee but not adopted by the Indian National Congress. Instead 1931b was adopted. In 1931, when the A.I.C.C. met at Karachi, a resolution was passed stressing the need for a flag which would be officially acceptable to the Congress. There was already considerable controversy over the significance of the colours in the flag. Communal troubles had set in. The two major communities were at the parting of the ways and the stress was on communal interpretation. Meanwhile a committee of seven was appointed to elicit opinion on the choice of a flag. It suggested a plain saffron flag with a charkha in reddish brown in the extreme left-hand corner. The A.I.C.C. did not accept the suggestion. "The year 1931 was a landmark in the history of the flag. A resolution was passed adopting a tricolor flag as our national flag. From the cover of the August 1997 issue of 'History Today'. This is the only flag of the Indian National Congress of which I was previously aware: it shows a horizontal tricolour of orange, white and green with a dark blue spinning wheel on the central stripe. Indian National Congress adopted this flag 6 August 1931 (Singh). It was first hoisted 31 August 1931, a date declared as Flag Day. Proportions were 2:3. "For thirty years, the tricolour sash of homespun cotton khadi, soon to replace the Union Jack on India's horizons, had flown over meetings, marches and manifestations of a people thirsting for independence. Gandhi had designed the banner of a militant congress himself. At the centre of its horizontal bands of saffron, white and green, he had placed his personal seal, the humble instrument he'd proposed to the masses of India as the instrument of their non-violent redemption, the spinning-wheel. "Now with independence at hand, voices in the ranks of congress contested the right of what they called 'Gandhiji's toy' to occupy the central place in what was about to become their nation's flag. To a growing number of party militants his spinning-wheel was a symbol of the past, a woman's thing, the hallmark of an archaic India turned inwards upon herself. "At their insistence the place of honour on the national flag was assigned to another wheel, the martial sign of the conquering warriors of Ashoka, founder of the Hindu empire, had borne on their shields. Framed by a pair of lions for force and courage, Ashoka's proud symbol of strength and authority, his dharma chakra, the wheel of the cosmic order, became the symbol of the new India. "Gandhi learned of his followers' decision with a deep sadness. 'However artistic the design may be,' he wrote, 'I shall refuse to salute a flag which carries such a message.'" The book also mentions the Tower of Residence in Lucknow, north-east India. The tower had become a symbol of the unconquerable Empire after resisting an 87-day siege in 1857. According to the book, it was the only place in the British Empire where the Union Jack was never lowered. On the eve of Indian independence in August 1947, the Warrant Officer took down the flag, had his men chop down the metal flagpole with an axe, hack out the foundations and cement over the hole where it had stood. They were determined that no other nation's flag would fly from this sacred spot. The national flag adopted at the time of independence. The original colors (ca. 1920) were red and green to represent Hindus and Moslems, respectively, to which white was added. Because that flag emphasized division, many were dissatisfied with that flag which led to the adoption of the saffron-white-green. This flag was adopted by the independence movement in August of 1933. Sources: Smith (1980), Flags and Arms across the World; Talocci (1982), Guide to the Flags of the World; Crampton (1989), The Complete Guide to Flags. On 15 August 1947 the dominions of India and Pakistan were established. India adopted the familiar horizontal tricolor of orange, white, and green with a blue Ashoka Chakra at the center. The tricolor had been used, unofficially, since the early 1920s as the flag of the Indian National Congress, with the colors representing Hinduism (orange), Islam (green), and a hoped-for unity and peace (white). More unofficially, the flag was patterned on the other example of struggle against British imperialism, Ireland. Most often, a blue spinning wheel was shown in the center, derived from Gandhi's call for economic self-sufficiency through hand-spinning. It was this flag that was first hoisted as the "official" Indian flag in Berlin on 3 December 1941. The spoked Ashoka Chakra (the "wheel of the law" of the 3rd-century BC Mauryan Emperor Ashoka) replaced the Gandhian spinning wheel to add historical "depth" and separate the national flag from the INC party flag (and Indian political party flags are another tale). The colour of the orange stripe on the Indian flag should officially be "saffron", which is somewhat deeper than shown here. I personally think it is close enough, given the problems of reproducing colours accurately. A black and white picture of the ceremony can be seen at http://www.india-fr.com/images/histoire/drapeau.jpg. The caption is "Hoisting of the Indian flag on 15 August 1947. There is a wrong perception in India that Pingali Venkayyaa had designed the Indian National flag adopted on 22 July 1947. This is not true. Pingali did not design the present national flag of India. On 23 June 1947 when the Constituent Assembly of India set up a nine-member ad hoc committee under the Chairmanship of Dr Rajendra Prasad to recommend a new flag for Independent India. It was Mrs Surayya Badr-ud-Din Tyabji who designed the Asoka Chakra Flag of India. The Constituent Assembly approved unanimously her design on 18 July 1947. It was then decided that Pandit Jawaharlal Nehru would place the recommendations before the Constituent Assembly on 22 July 1947. The flag used during India�s early phase of freedom struggle �white over green over red (not saffron) emblazoned with a Charkha (spinning wheel) in the centre was designed by Pingali Venkayyaa. The flag was known variously as Swaraj Flag, Congress Flag, Gandhi Flag, etc. Mahatma Gandhi called it National Flag. Gandhi in an article titled �The National Flag� in Young India in April 1921, had focussed his ideas about what should constitute our flag. 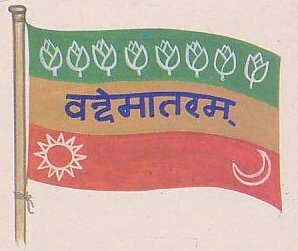 Pingali Venkayyaa was then asked to modify his (Pingali�s) earlier design - a plain �green over red� flag to incorporate Gandhi�s idea on the flag. The Swaraj flag was never adopted by the Indian National Congress (INC) as the National flag by a formal resolution. The flag because of its close similarity with the Bulgarian National flag and interpretations of its colour combination in the context of religions were felt unacceptable. It failed to get hold of Pan-Indian acceptance. Demands were put forward from time to time for re-designing the national flag based on the general consensus and mood of the people. There was consensus opinion that India should have a distinctive flag. After many deliberations the Congress Working Committee (CWC) for the first time officially adopted a �saffron over white over green� flag and proclaimed it Purna Swaraj Flag (Complete Independence Flag) in its Bombay session on 8th August 1931. The flag was used as National flag till independence. Dr N. S. Hardikar transferred the design onto Khadi bunting. Initially, the flag had the �spindle� of the charkha towards the pole, but later the position was altered towards the fly-end. Attempts at debunking the Pingali Venkayyaa myth had not been very fruitful (excepts in books written by serious scholars, viz Cdr K.V.Singh of Flag Foundation of India, Arundhati Virmani, Sadan Jha, et al). When a belief has been in circulation, people find it difficult to negate it, even when pointed out. Madam Cama was born of rich Parsi parents. From the beginning, she was a rebel and a nationalist. She learned languages and became proficient in arguing her country's cause in different circles at a young age. She was married to Rustom K.R. Cama, who adored British and loved their culture, whereas she believed that British had fleeced India and practiced the worst form of imperialism. The marriage proved to be incompatible and Madame Cama plunged into several social activities. She was in the forefront of a voluntary team which strived to save plague victims in Bombay, caught the disease herself and was miraculously saved. She was left very weak and went to Europe for rest and recuperation. She settled in 1902 in London. In London, she served as private secretary to the great national Indian leader Dadabhai Navaroji. Later, she promoted herself the freedom struggle. At that time, the British arrested revolutionaries in India for life on the basis of treason. Treason was the greatest crime in the Indian continent, which ensured a minimum of six years of black waters (kalapani), or deportation to Andaman islands, an archipelago lost in the Andaman Sea, south of Burma, and harsh punishment. In 1907, Madame Cama unfurled the first Indian National Flag in the International Socialist Conference in Stuttgart (Germany). The tricolor-flag Madam Cama unfurled had green, saffron, and red stripes. Red represented strength, saffron victory, and green stood for boldness and enthusiasm. There were eight lotuses representing eight provinces and flowers represented princely states. Vande Mataram in Devanagari adorned the central saffron stripe which meant "Salutation to Mother India". The sun and the moon indicated Hindu and Muslim faiths. The flag was designed by Veer Savarkar with the help of other revolutionaries. After Stuttgart, Madame Cama went to the United States and was known as "Mother India's first cultural representative to the United States". After returning to London, she started publishing booklets, urging to resist unjustified violence, standing for Swaraj (self rule): "March forward! We are for India. India is for Indians! ", and fighting for unity of Hindu and Muslims. She also funded revolutionaries in and out of India. Feeling that the British had decided to finish her off, Madame Cama sailed to France and was welcomed in Paris by world revolutionaries. She published and distributed the revolutionary magazines Vande Mataram and Madan's Talwar, which were outlawed in Britain and India. At the end of her life, Madame Cama decided to came to her motherland after 35 years in exile. She was very ill and died at Bombay hospital in 1936. The flag unfurled in Stuttgart was smuggled into India by Indulal Yagnik, the Socialist leader of Gujarat. It is now displayed at the Maratha and Kesari Library in Pune (Maharashtra). There is a small image of the flag attached to the article on the aforementioned website, fairly similar to David's image.